With fuel being the main input cost for the transport sector, rise in cost of operations is a given. The sector is unsure on the extent of being able to pass this on through rentals or to absorb it with higher volumes. With the rise in global crude oil prices and the resulting hike in home diesel and petrol costs, various products and services such as transport, food, medical equipment and imported goods are likely to become more expensive. Petrol and diesel prices affect five per cent and three per cent of the wholesale price index and consumer price index, respectively,” said Madan Sabnavis, chief economist at CARE Ratings. The past one year saw spot Brent crude prices rise 41 per cent to $76.7 a barrel on Friday. Diesel and petrol prices in India have increased in line with the rise in crude. On Friday, diesel cost Rs 72.1 a litre in Delhi, about 24 per cent higher from a year before; petrol was 15 per cent costlier at Rs 80 a litre. With oil marketing companies passing on most of the price hike to the end-customer and no duty respite from the Centre, fuel prices have remained high. "The spiralling diesel price hike is having a back-breaking impact,” stated the All India Motor Transport Congress, the premier truckers’ union. S P Singh, coordinator, Indian Foundation of Transport Research and Training, says the rise in fuel prices so far had been mitigated with higher truck rentals. “August saw a Rs 2.2 a litre diesel price hike but truck rentals also went up by four to five per cent on trunk routes. Truckers were also helped by 15-20 per cent higher arrival of fruit, vegetables and food items,” he said. The rise in food business helped negate the slump in cargo volumes from factory gates. Singh added that truck rentals had outpaced diesel price increases due to a steady economy and lower per tonne-km operating expense with migration to higher tonnage trucks/trailers. If truck rentals continue to rise, food prices are likely to bear the brunt, said Sabnavis from CARE. 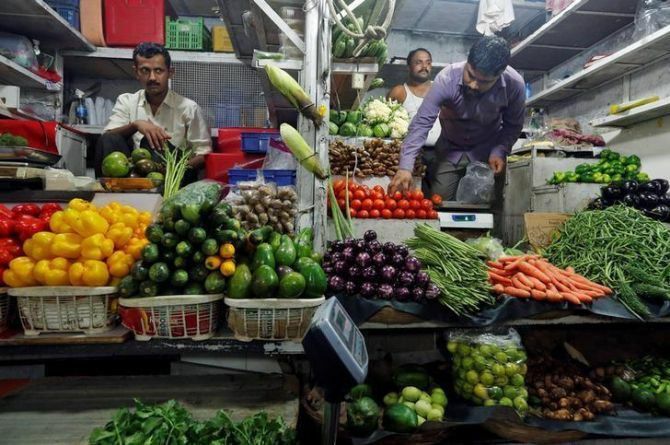 Some expect the hike in diesel prices to not immediately translate into a rise in fruit and vegetable rates but in squeezing farmers’ margins. Delhi and adjoining areas are a likely example. “For us here in the mandis (wholesale markets), price is determined by demand and supply. If supply goes down, prices will move; whatever is the supply, we have to buy it,” said Rajendra Sharma, former chairman of the huge market yard at Azadpur in North Delhi. For an average farmer, he added, if the earlier transport cost of a truck of onion was Rs 10,000, it is now Rs 12,000-15,000. “The loss is at his end, as his margins are getting squeezed. The increase in diesel prices also pushes up the cost of running pumpsets (used for irrigation),” Sharma said. Rajkumar Bhatia, a prominent fruit trader of Azadpur, said most mandis see farmers bear the cost of the produce till it is unloaded, which is why they have been hit. For forward movement from mandis to retailers, wholesalers have started relying on smaller tempos and carriages, to cut costs. However, if the rise in fuel price continues, food prices are expected to increase at the retail level. Some imported goods face a double-whammy effect of a weaker rupee and higher crude oil prices. “Prices of all imported items like petrochemicals, photography, newsprint, medical equipmemt and chocolates could increase in the coming days,” said Anuj Gupta, deputy vice-president at Angel Commodities. He expects a five to 10 per cent hike in prices of imported products due to the rise in crude oil. A Mumbai-based petrochemicals trader says naptha, plastic raw materials and other chemicals and solvents will all take a hit. “There is huge uncertainty (over prices) and demand for many petrochemicals has come to a halt. Purchases made by processors are limited to hand-to-mouth requirements,” he said. Prices for plastic goods and synthetic textiles are also on the rise as input costs increase, he added. The oil conundrum: How to bring down the prices?